Ubuntu 11.04 (Code named as ‘Natty Narwhal’) has some good applications, installed by default but still a lot of apps isn’t, due to some licensing problem. RAR (short for Roshal ARchive, a proprietary archive file format ) compression tool is a shareware software, that’s why it’s not installed by default. Ubuntu 11.04 has support for some common compressed files formats like tar, bz2, gz, zip etc, but not for rar. So if you will try to open a ‘file_name.rar’ file, then an error message will be displayed saying that – ‘File Format Not Supported!’. That’s why, you need to install RAR Compression/uncompression tool. You can install it from command line or Ubuntu Software Center or Synaptic Package Manager. #1 : open Ubuntu Software Center (from the left icon panel) and search for ‘rar’. #2 : Then click on install button to install the rar package. #3 : That’s All..wait until the installation is complete. Then right click on the file, and extract it or just double click or select extract here to begin the uncompression process. 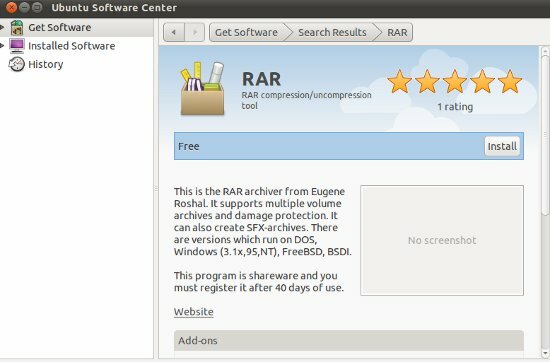 RAR(Roshal Archive) is an archive file format and supports data compression,file spanning and error recovery.On Ubuntu 10.10 Maverick Meerkat RAR files can be open,unpacked or extracted by many applications e.g rar,7-Zip,PeaZip,unrar,winRAR. 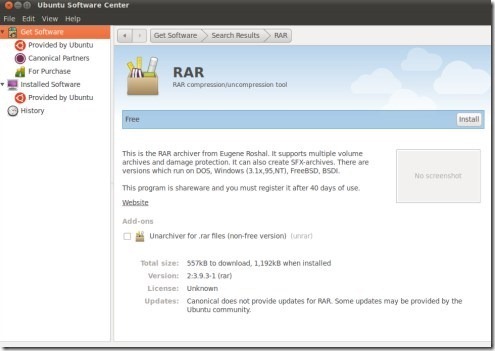 Open Ubuntu Software Center and search for ‘rar’.Install RAR compression/uncompression tool but remember it’s a shareware software so you must have to register after ending the trial period of 40 days.To install RAR tool just click on the install button(located in right end) and wait for the installation to complete(you may have to authenticate yourself by entering your ubuntu login password). That’s All..Now you can select any RAR file and right click,then extract to the desired location. If you have just installed the Ubuntu 10.04 on your computer and wondering for a software to open .RAR file ..this post will surely help you.The fact is that,after fresh installation of ubuntu 10.04 you will have to install some extra software(like Adobe Flash player,VLC player,CSS library for encrypted dvd playback..) for basic needs(If you have installed Ubuntu 10.04 from standard CD). 1. Open Ubuntu Software Center or Synaptic Manager and Search for RAR. 2. Click on install to proceed for installation. 3. Wait for few minutes to finish the download and installation will begin automatically …and finish within few moments. 4. Installation completed successfully…now to open .RAR file,just click(right) on them and open with archive manager(or use double click).Everything will work expected and you would be able to extract rar files easily.